BCC and SCC are the most common forms of skin cancer and are collectively referred to as nonmelanoma skin cancers. 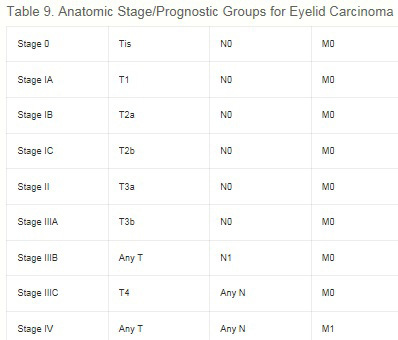 There are separate staging systems for carcinomas of the eyelid versus other skin surfaces. The staging system for non-eyelid skin cancers is primarily designed for squamous cell carcinomas (SCCs). 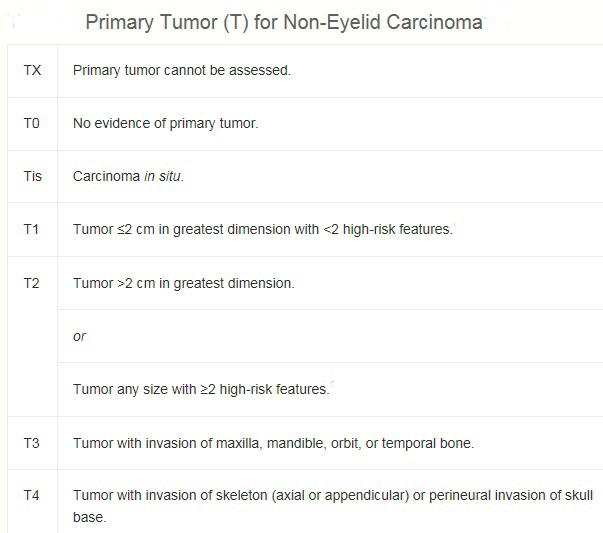 The staging system for carcinoma of the eyelid addresses carcinomas of all histologies. Basal cell carcinoma (BCC) rarely metastasizes, thus, a metastatic work-up is usually not necessary. Regional lymph nodes should be routinely examined in all cases of SCC, especially for high-risk tumors appearing on the lips, ears, perianal and perigenital regions, or high-risk areas of the hand. In addition, regional lymph nodes should be examined with particular care in cases of SCCs arising in sites of chronic ulceration or inflammation, burn scars, or sites of previous radiation therapy treatment. M0 ----- No distant metastases. Stage I: T1, N0, M0. 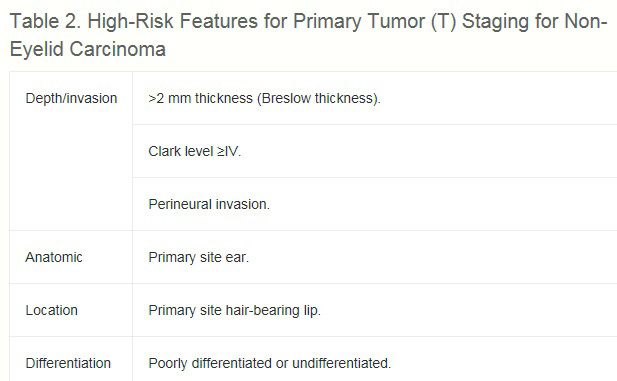 Stage II: T2, N0, M0.Tumors that are T1,N0 can be upstaged to stage II if they contain two or more high-risk features. • Clinical, histologic, or radiologic evidence of one involved lymph node measuring 3 cm or less in size. • Tumor extension into bone; namely, the maxilla, mandible, orbit, or temporal bone. • Tumor with direct or perineural invasion of skull base or axial skeleton. • Two or more involved lymph nodes. • Single or multiple involved lymph nodes measuring more than 3 cm in size. Basal cell carcinoma (BCC) is at least three times more common than SCC in nonimmunocompromised patients. It usually occurs on sun-exposed areas of skin, and the nose is the most frequent site. Although there are many different clinical presentations for BCC, the most characteristic type is the asymptomatic nodular or nodular ulcerative lesion that is elevated from the surrounding skin, has a pearly quality, and contains telangiectatic vessels. 1. Excision with margin evaluation. Excision has been compared in randomized trials to radiation therapy, Mohs micrographic surgery, photodynamic therapy (PDT), and cryosurgery. Mohs micrographic surgery is a specialized technique used with the intent to achieve the narrowest margins necessary to avoid tumor recurrence, while maximally preserving cosmesis. 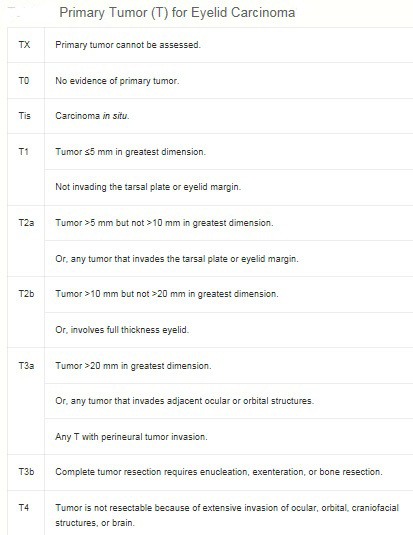 It is best suited to management of tumors in cosmetically sensitive areas or for tumors that have recurred after initial excision (e.g., eyelid periorbital area, nasolabial fold, nose-cheek angle, posterior cheek sulcus, pinna, ear canal, forehead, scalp, fingers, and genitalia). It is also often used to treat tumors with poorly defined clinical borders. Mohs micrographic surgery requires special training. The tumor is microscopically delineated, with serial radial resection, until it is completely removed as assessed with real-time frozen sections. Noncontrolled case series suggested that the disease control rates were superior to other treatment methods for BCC. However, as noted in the section on excision, the disease control rate was not clearly better when directly compared to surgical excision of facial BCCs in a randomized trial of primary BCCs. Radiation therapy has been compared to excision in a randomized trial that showed better response and cosmesis associated with surgery. In case series, PDT has been associated with high initial CR rates. However, substantial regrowth rates of up to 50% have been reported with long-term follow-up. A randomized trial of PDT versus excision is summarized in the section on simple excision above. Two small trials, one reported in abstract form only, comparing PDT with cryosurgery are summarized in the cryosurgery section above, showing similar antitumor efficacy but better cosmesis with PDT. Topical 5-FU, as a 5% cream, may be useful in specific limited circumstances. It is a Food and Drug Administration (FDA)-approved treatment for superficial BCCs in patients for whom conventional methods are impractical, such as individuals with multiple lesions or difficult treatment sites. Safety and efficacy in other indications have not been established. [Level of evidence: 3iiiDiv] Given the superficial nature of its effects, nonvisible dermal involvement may persist, giving a false impression of treatment success. In addition, the brisk accompanying inflammatory reaction may cause substantial skin toxicity and discomfort in a large proportion of patients. There have been a number of randomized trials of imiquimod. However, the designs of all of them make interpretation of long-term efficacy impossible. 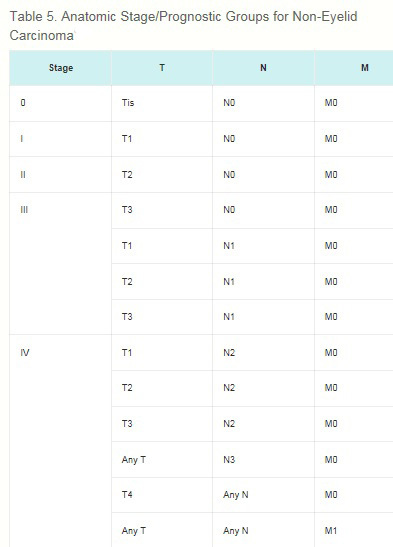 Most were industry-sponsored dose-finding studies, with small numbers of patients on any given regimen; and patients were only followed for 6 to 12 weeks, with excision at that time to determine histologic response. [Level of evidence 1iDiv] Therefore, although imiquimod is an FDA-approved treatment for superficial BCCs, some investigators in the field do not recommend it for initial monotherapy for BCC; some reserve it for patients with small lesions in low-risk sites who cannot undergo treatment with more established therapies. Squamous cell carcinoma (SCC) also tends to occur on sun-exposed portions of the skin, such as the ears, lower lip, and dorsa of the hands. However, SCCs that arise in areas of non–sun-exposed skin or that originate de novo on areas of sun-exposed skin are prognostically worse because they have a greater tendency to metastasize than those that occur on sun-exposed skin that develop from actinic keratosis. People with chronic sun damage, sites of prior burns, arsenic exposure, chronic cutaneous inflammation as seen in longstanding skin ulcers, and sites of previous x-ray therapy are predisposed to the development of SCC. SCCs are composed of keratinizing cells. These tumors are more aggressive than BCCs and have a range of growth, invasive, and metastatic potential. Prognosis is associated with the degree of differentiation, and tumor grade is reported as part of the staging system. A four-grade system (G1–G4) is most common, but two- and three-grade systems may also be used. Mutations in the PTCH1 tumor suppressor gene have been reported in SCCs removed from patients with a prior history of multiple BCCs. 1. Surgical excision with margin evaluation. Mohs micrographic surgery is a specialized technique used to achieve the narrowest margins necessary to avoid tumor recurrence, while maximally preserving cosmesis. In case series, it has been associated with a lower local recurrence rate than the other local modalities, but there are no randomized trials allowing direct comparison. 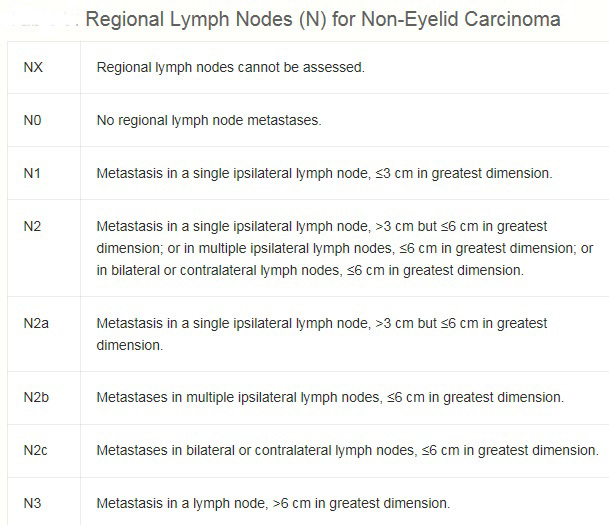 This surgery is best suited to the management of tumors in cosmetically sensitive areas or for tumors that have recurred after initial excision (e.g., eyelid periorbital area, nasolabial fold, nose-cheek angle, posterior cheek sulcus, pinna, ear canal, forehead, scalp, fingers, and genitalia). Radiation therapy is a logical treatment choice, particularly for patients with primary lesions requiring difficult or extensive surgery (e.g., nose, lip, or ears). Radiation therapy eliminates the need for skin grafting when surgery would result in an extensive defect. Cosmetic results are generally good, with a small amount of hypopigmentation or telangiectasia in the treatment port. Radiation therapy can also be used for lesions that recur after a primary surgical approach. Radiation therapy is avoided in patients with conditions that predispose them to radiation-induced cancers, such as xeroderma pigmentosum or basal cell nevus syndrome.